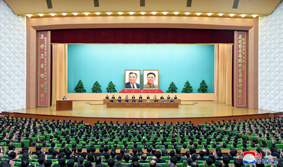 A national seminar took place at the People's Palace of Culture on September 6 to deeply grasp the feats of President Kim Il Sung, Chairman Kim Jong Il and Supreme Leader Kim Jong Un and glorify them. Present there were Yang Hyong Sop, vice-president of the Presidium of the Supreme People's Assembly of the DPRK, Pak Kwang Ho, vice-chairman of the Central Committee of the Workers' Party of Korea, and officials of Party and administrative bodies and working people's organizations, armed forces organs and science, education, literature and arts, media and party cadre training institutions and the field of preservation of revolutionary relics in Pyongyang. The seminar heard papers dealing with the feats of Kim Il Sung and Kim Jong Il and explaining the tasks and ways for realizing their patriotic desire for building a powerful country under the leadership of the Workers' Party of Korea. Speakers referred to the fact that the President ushered in the rise for building a socialist state and turned the DPRK into the Juche-oriented socialist country shining with independence, prospering with self-support and impregnable with self-reliance in national defence. They said that Kim Jong Il turned the DPRK into a dignified politico-ideological power and an invincible military power through the Songun revolutionary leadership day and night. They noted that Kim Il Sung and Kim Jong Il were the great models of giving priority to the people and respecting them as they developed the DPRK government into the representative of the independent right of the popular masses and the organizer of their creative activities. They said Kim Jong Un is a peerlessly great man who is turning the DPRK into a dignified people's country and bringing earlier the final victory of building a Juche-oriented power under the banner of independence. They expressed their will to wage a dynamic struggle for bringing about the comprehensive prosperity of socialism under the leadership of Kim Jong Un.